On Wednesday, December 2, 2015, we were thrilled to be able to present this donation to Susan Sides, Executive Director of the Lord's Acre. Many thanks to you, our generous patients, who made this donation possible. We couldn't do it without you! 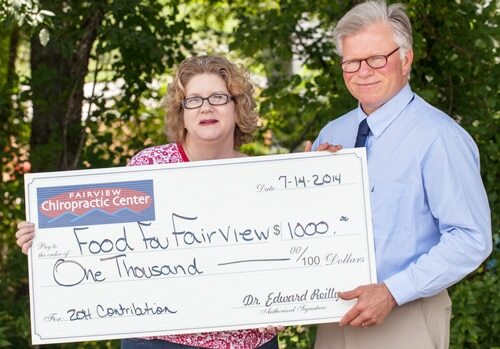 Dr. Reilly presenting a check to Food for Fairview for $1,000 in July 2014. For the past 15 years, Dr. Reilly, his staff and patients have collected monies for various charities and donated them to the organizations. Drs. 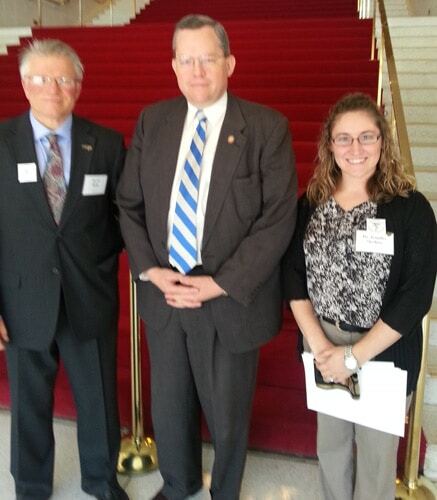 Ed Reilly and Jennfier Sales met with Nathan Ramsey in Raleigh on March 13, to discuss chiropractic copay legislation as part of the North Carolina Chiropractic Association’s legislative day. 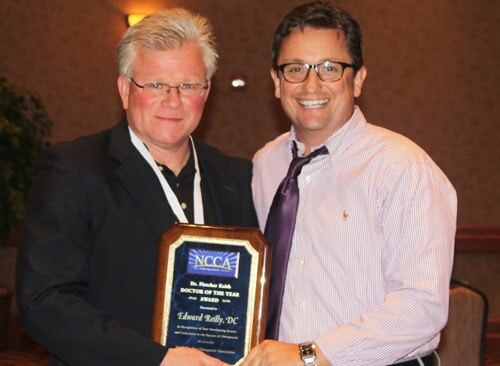 Dr. Reilly is the president of the North Carolina Chiropractic Association and Dr. Sales is board secretary. Fairview’s own Nathan Ramsey is the house district 115 representative which includes the Fairview area. Dr. Reilly supports ACRHS Boosters! 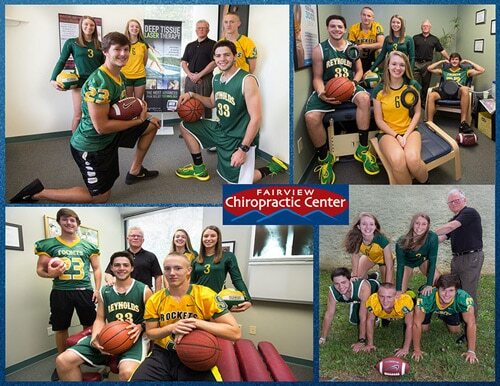 Dr. Reilly poses with senior ACRHS athletes for the 2016-2017 ACRHS Booster calendar, which benefits the ACRHS All Sports Booster Club. 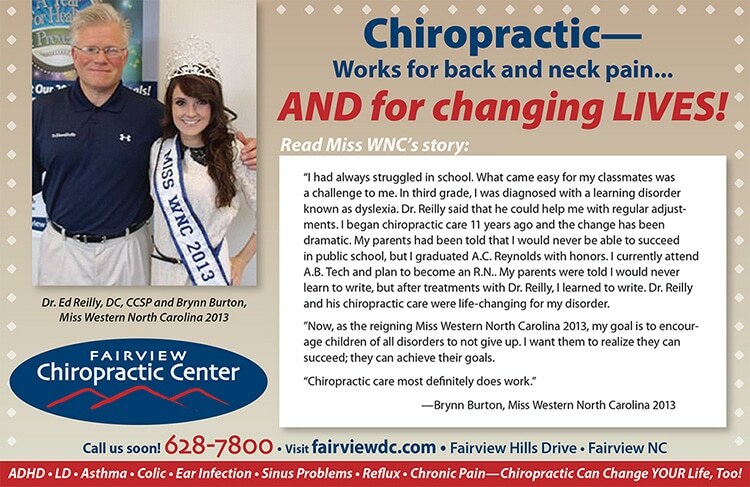 Dr. Reilly has also served as the chiropractor for the school's athletic teams since 1998. We designated 2012 as the “Year of Health & Healing”. As part of this, we have made a $4000 pledge to support three community organizations. 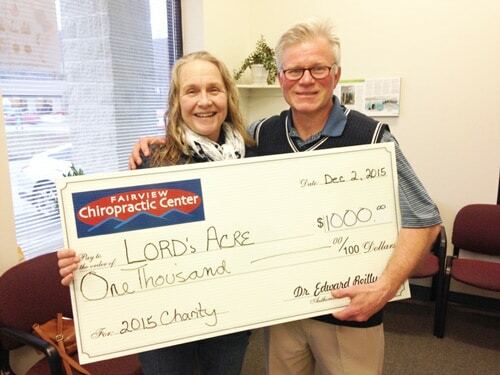 In this photo, Franklin and Susan Sides, board members of The Lord’s Acre, accepted a check for $1,220 from Fairview Chiropractic Center. 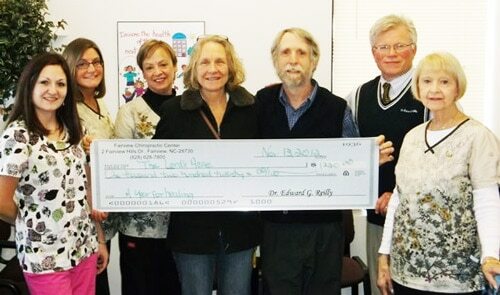 The Lord’s Acre is the third local charity to benefit from our 2012 “Year of Health & Healing” program. Food for Fairview and Relay for Life have both already received donations collectively of $2500. 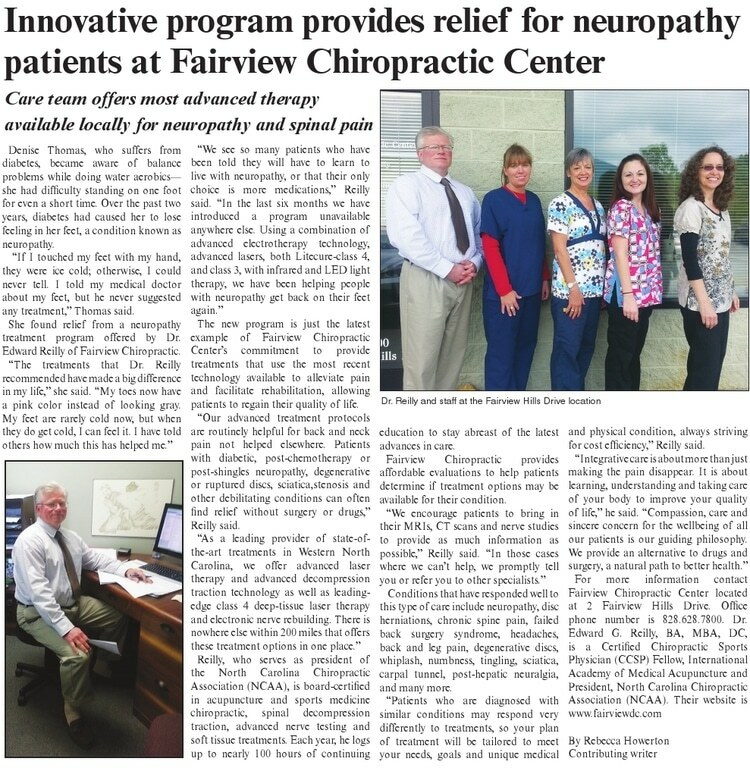 Our “Year of Health & Healing” will continue through the end of the year and into 2013 at Fairview Chiropractic Center. We thank all of our wonderful patients and community members who made these donations possible. 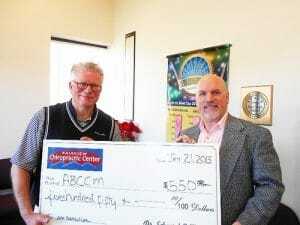 Dr. Reilly presented a check to Mark Robertson of ABCCM for $550.00 on January 21, 2015. Dr. Reilly and his patients contribute to a number of Asheville-area nonprofits throughout the year by agreeing to donate a portion of certain types of exam fees. Dr. Reilly encourages this practice to benefit the community but he also hopes to inspire other area businesses to do the same. Check out Dr. Reilly presenting a check to Cassie Imholz on behalf of Food for Fairview for $1,000. For the past 15 years, Dr. Reilly, his staff and patients have collected monies for various charities and donated them to the organizations around the holidays. Dr. Reilly wants not only to support these organizations but also hopes to inspire other local businesses to engage in similar fundraisers in support of organizations that are important to them. Dr. Reilly presents one of two checks for a total of $700 to Mark Robertson on behalf of Asheville Buncombe Community Christian Ministry's (ABCCM) Circle Program. For the past 15 years, Dr. Reilly, his staff and patients have collected monies for various charities and donated them to the organizations around the holidays. 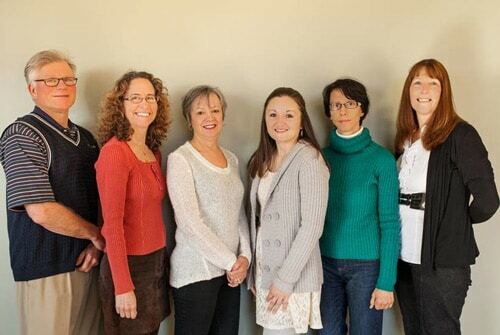 This Thanksgiving weekend, we are thankful for our clients who helped us reach our 2013 charity goals. Here is Dr. Reilly presenting $1000 to Sandy Sides on behalf of The Lord's Acre.